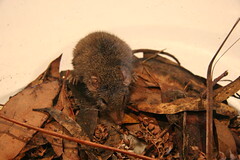 Our friends Robyn and Rolley managed to catch one of the antechinus that inhabit their home and bring it over for us to take a look. These little marsupials have a very unusual life cycle. Their mating season happens once a year, around August in the Blue Mountains, the males race around trying to copulate with every female in sight (when they succeed it takes around six hours), then after a couple of weeks of this all the males drop dead from exhaustion ... literally. All the males die. Talk about going out with a bang.